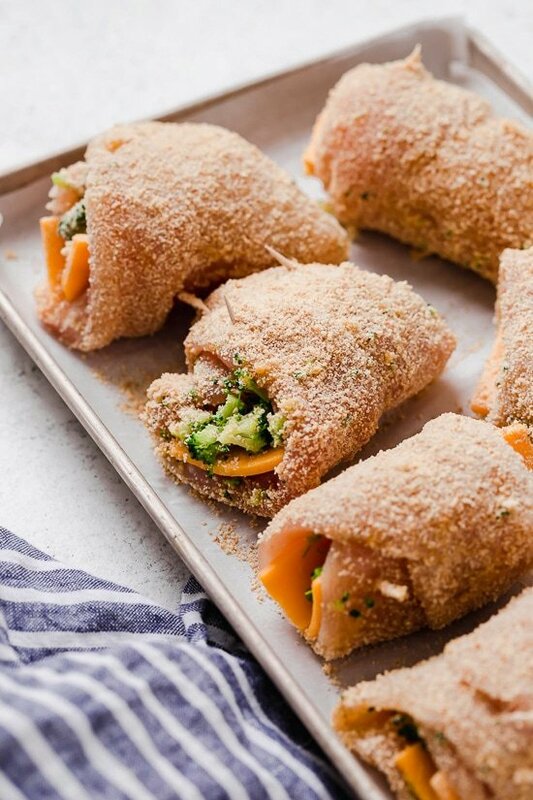 Broccoli and Cheese Stuffed Chicken are filled with cheddar and broccoli, then rolled up, breaded and baked in the oven or air fryer! This easy recipe is perfect any day of the week. I make it with fresh broccoli, but leftover or frozen broccoli can also be used. 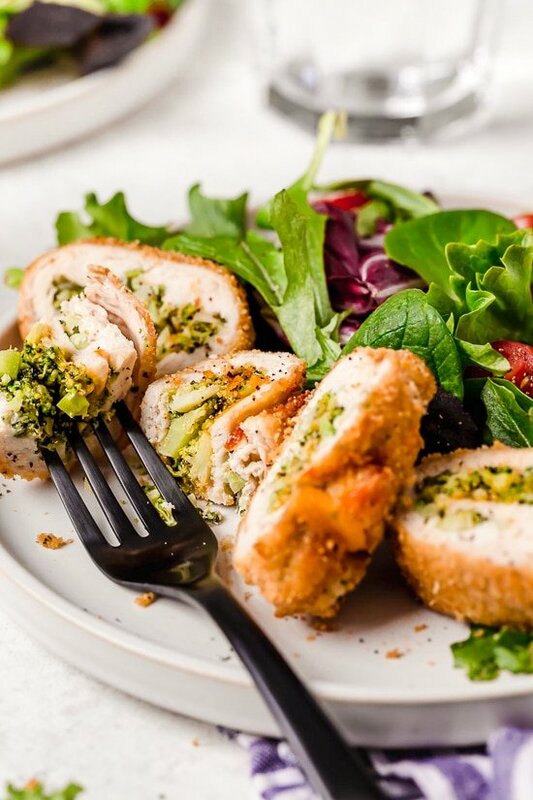 I make stuffed chicken so many different ways, this broccoli and cheese version is a favorite, but we also love Chicken Cordon Bleu, Zucchini and Mozzarella Stuffed Chicken and Chicken Rollatini Parmesan, to name a few. 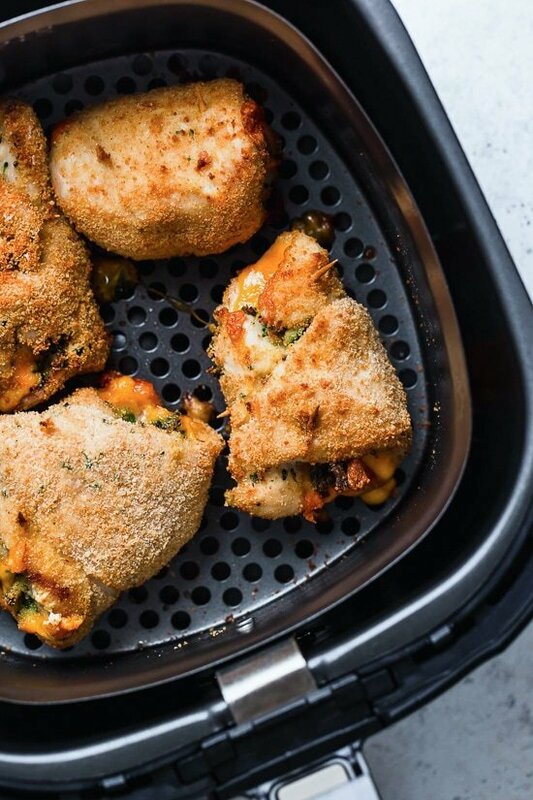 I tested this both in my oven and Skinnytaste Vremi Air Fryer that you can pre-order now, it comes out early May! The results came out best in the air fryer, they were crispier and took half the time. 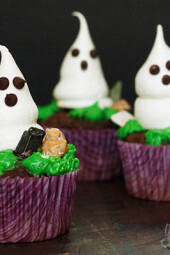 Whichever way you make them, they will still taste great. Serve this with a garden salad to make it a meal. You can stuff chicken breasts with anything you can think of! 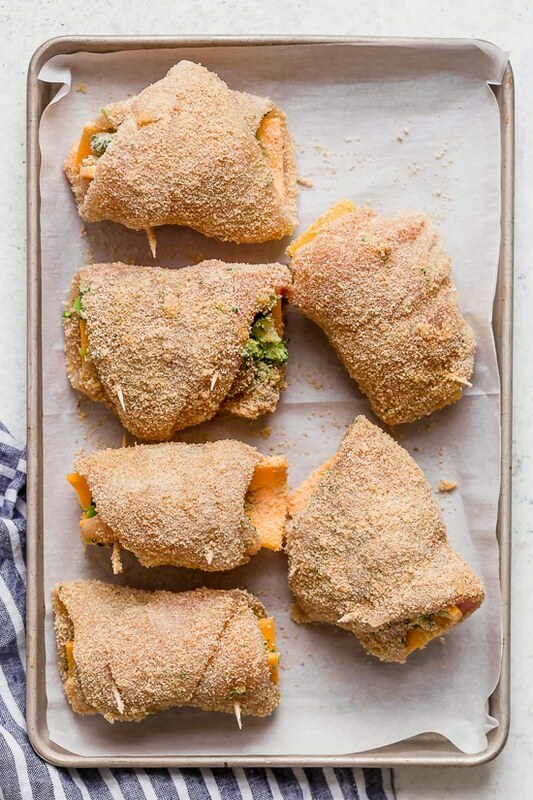 If you wish to make them dairy-free, you can leave the cheese out and use unseasoned breadcrumbs. To make them low-carb, you can leave the breadcrumbs out or try wrapping them in bacon. Preheat oven to 425F. Spray a sheet pan with oil. Place broccoli in the microwave with 1 tablespoon water, cover and cook 1 minute until soft. Drain and season with 1/4 teaspoon salt. In a small bowl, combine egg, water and a little salt and beat with a fork; set aside. Fill a second bowl with breadcrumbs. If the chicken isn’t 1/4-inch thin, pound it thin with wax paper and a mallet. Season both sides of the chicken with 1/2 teaspoon salt. Place a 1/2 slice cheese in the center of the chicken and top with 2 tablespoons broccoli. Roll the chicken around to completely cover cheese, using toothpicks to secure the ends, if needed. Dip chicken into egg wash, then breadcrumbs and transfer to a sheet pan. Spray both sides of the chicken with oil and bake about 25 minutes, until cooked. Remove toothpicks and eat. Preheat air fryer to 400F. Spray a sheet pan with oil. If the chicken isn’t thin enough to easily roll, pound it thin with wax paper and a mallet. Season both sides of the chicken with 1/2 teaspoon salt. Place a 1/2 slice cheese in the center of the chicken and top with 2 tablespoons broccoli. Dip chicken into egg wash, then breadcrumbs and transfer to a work surface. Spray both sides of the chicken with oil and transfer to the air fryer basket, in batches. Cook about 14 to 16 minutes, turning halfway until the chicken is cooked through in the center. Remove toothpicks before eating. I’ll be making again next week. Used my air fryer for the first time with this recipe. It was delicious and so easy. Just made these today since I had most ingredients in the fridge. I definitely recommend buying the pre-sliced thin chicken breast. I was using one super large 10 oz chicken breast, and wasn’t able to get consistent slices from it, but ended up making six 1.5-2oz cutlets. I just used a ton of toothpicks, and it worked out ok! They were more like stuffed nuggets, which was fun. I’m not an egg fan, so I coated them in whole wheat flour and then dipped them in almond milk before the breading, and it worked PERFECTLY. That’ll now be my go to method of breading. I do recommend the recipe as long as you can buy the thin sliced chicken breasts. This recipe was so easy! I can’t do onions so I bought plain gluten free breadcrumbs and seasoned them myself with Italian seasoning, salt, and pepper. It was delicious! Nice and crispy. So easy to make. Toothpicks kept it from falling apart. So yummy with a little BBQ sauce to dip in. This is going to be a regular in the rotation for us! 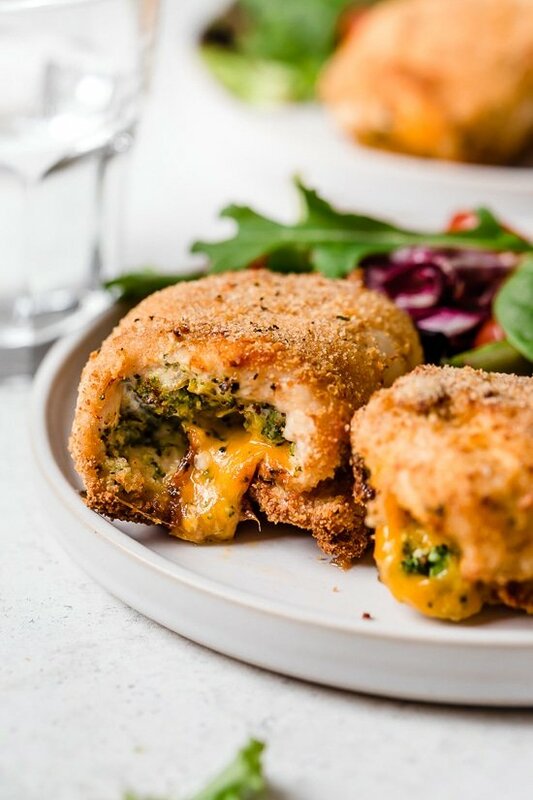 I have made these, and they’re delicious, just one problem….how do you get the cheese NOT to melt out??? Any suggestions? Recipe Is a hot mess! Found it very difficult to keep together, had broccoli all over the place. Chicken falling apart. Would not pound out thin enough to roll well. Will not be making again. Gonna leave this to the pros! Don’t care how healthy it is! Sounds like chef error to me. Can you prep and freeze for later use without cooking it first? If freezing, do you cook the chicken first, or would you simply prepare the recipe and skip cooking it until you are ready to eat it? This was delicious!! It looked pretty and was fairly simple. I pounded the chicken to make it easier to roll, which made it so tender. This is something I’ll make a few times/month for sure. Thanks Gina! I made this recipe with the cheddar and brocolli and it was DELICIOUS! I also bought gluten free panko and seasoned that a little before coating the stuffed chicken breasts. They came out so good!! I’m so excited. I get bored with the same recipes on WW so this is definitely an addition to the rotation. Husband loved them too! Thank you Gina, you are amazing with your recipes and helping out a cook with no confidence (Me) feel like she is actually a good cook! Crowd pleaser with everyone in the family. Even the 18 month old was clapping their hands it was so good! Will definitely make again. No air fryer….how long in the oven? can you roll the night before and bake off the next day? Big thumbs up for this one from my husband and 12yr old son. I made it with Swiss cheese for my husband and mozzarella for me and my son. This will be regular meal for dinner. yikes–when i plug the nutrition information into weight watchers’ site, i get NINE points, not four! 🙁 this was delicious, but i don’t like that difference. To get the accurate point count for Freestyle, try putting the ingredients into the WW recipe builder. The nutrtional info by itself doesn’t work for point counting because it doesn’t take into account the 0 point foods like the recipe builder does. This was very good. Unfortunately it’s 9 points on WW another 4. I saw this comment regarding this issue. I’m not really sure what you mean by recipe builder and it’s frustrating to make it and then find out it’s not 4 points. The new plan, veggies and chicken are 0. If you use the calculator it will add points to 0 point foods so the only accurate way to calculate is to use recipe builder on the WW site and imput all the ingredients. That is how I do it and the only accurate way. Made it tonight — delicious! Lol… I am making it right now and wondered the same!! I would just use FF shredded. It doesn’t look like the sliced even melts. Same question! How many oz cheese goes in each one? I’m tracking points and cheese can make a huge difference. Help please! I wish you had a thing where we could save recipes on your website. That be AWESOME!! I highly recommend the app Paprika. Why is it that when you go to print a recipe, the picture no longer shows up on the the printed version like it did previously? Now, you have to save the pictures separately as a JPEG file which is inconvenient. My husband and I make this at least once a week, it’s definitely our favorite recipe that you have posted! I usually make it with mozzarella cheese, as the original recipe called for, but I’m going to try it with the cheddar! Love it! How does this serve 9 if you’re cutting 3 breasts in half? Any advice on reheating these? They were delicious when I made them last night and I want to have the leftovers but I’m sure they don’t need to be cooked for as long or at the same temperature. Anyone have any advice on this? If making as a freezer, later meal, will the breaking be soggy once defrosted? This was awesome! I was super surprised because I thought it was quite a bit of work getting the chicken breasts thin enough to roll. I’d definitely make again! Made this tonight. Soooo good! Thanks for the recipe. Even my picky 3 year old ate it! Yay!! All of your recipes are winners. Is there another low point cheese that can be used, if you don’t like Swiss cheese? It helped me to bread the breasts and then stuff them. Did you steam the broccoli first? Made this last night and – YUM! – what a delicious combination of flavors. This will definitely become one of our go-to recipes! My 5 year old and I made these tonight with cheddar, our store didn't have reduced fat swiss. I guess that's what happens when you live in a small town! Anyway, my son LOVED the chicken! He ate 2 pieces in record time! Thank you so much for all do for those of us on WW! It makes it so much easier!! I made this and it was a huge hit with my kids and husband. I've never made stuffed chicken and never knew how easy it was! I am going to try to use a box of cooked chopped broccoli mixed with a couple of wedges of Laughing Cow Cheese (swiss) and just a bit of shredded sharp cheddar. I'll let you know how it turns out. I think I am going to skip the breadcrumbs to save carbs and just brush a bit of olive oil on the top and sprinkle some Italian seasoning on top. We used to buy these all the time from Market Day, but I think I can make them myself much healthier and cheaper too! Update: they turned out wonderful with the box of cooked chopped broccoli and 2 wedges of Laughing Cow cheese, and I skipped the breading. My picky 8 year old son, who doesn't like to try anything loved it! I made this tonight and they were fantastic! The boyfriend and I had a bit of a hard time stuffing and rolling them correctly, but I guess that comes with practice, right? Next time I'll probably buy the thin strips of chicken instead of slicing them myself. We served this with your mango quinoa salad (with an addition of avocado) and the two seemed to pair quite nicely. I hope these end up in the cookbook! I have to tell you, having had bariatric surgery I love your recipes because they emphasize smaller portions and you don't feel like you are eating something light and healthy because the recipes have so much flavor. 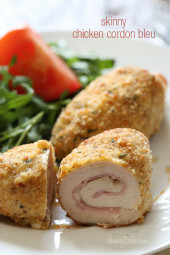 I have already tried the Jalapeno popper stuffed chicken, have to try this one as well! I made this twice in one week. Once for a friend who just had a new baby. I made it for her and her husband and their four year old and they all loved it. I was able to share the extra with my husband and we are obsessed. I made it both times with dill Havarti cheese and simply amazing. I also used a spicy panko crust. Hey Gina! I just prepared these but I am freezing them prior to baking. How long would you recommend baking these when we are ready to have them for dinner? Thanks! Dinner tonight! Love your blog, Gina! It always saves me when I can't think of anything to make! Thank you, thank you, thank you! 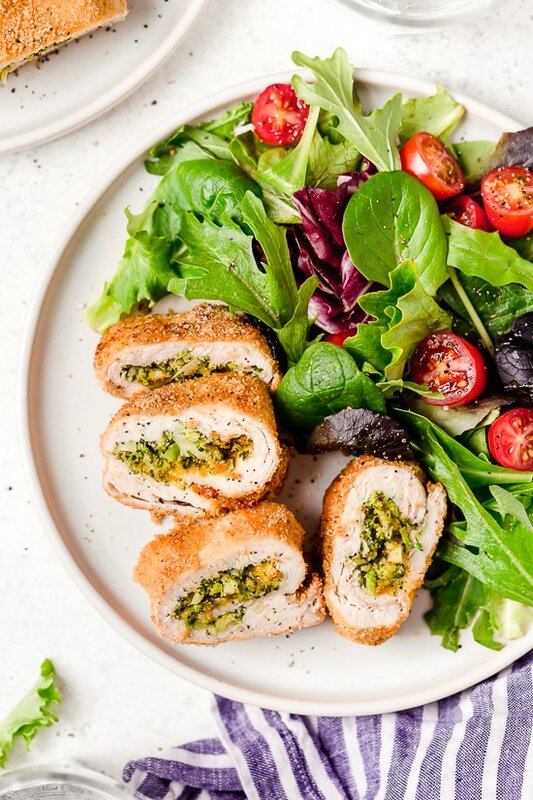 I love the chicken roll ups but was wondering if I would be cheating if I just used the thicker slice of breast and just slit it open and stuffed the other ingredients inside? I realize I would have to account for my points differently that way but I am hopeless with the rolling. I ended up just folding mind because they were thicker than I had originally planned. I didn't use the egg wash and just lightly breaded them. They were awesome! I had breasts with bone on so I deboned and made cutlets. Doctored up my bread crumbs with italian seasoning with garlic and onion powder. Put spinach and one small piece of ham and low fat swiss. Excellent!!!! Can you substitute egg whites? I subbed egg whites and they came out beautifully. Loved loved loved so easy and delicious I made with the sauteed zucchini and tomato. Looks awesome and easy.. making this for dinner tonight! My husband loved this one. The Swiss cheese made it a little bland so I will use more salt next time. Overall, chicken was juicy and loved the broccoli inside, yummy! I made this last night but had to use American cheese (forgot to buy the swiss)so adjusted the points accordingly. Everyone loved it– served with extra broccoli, and for the kids and hubby, who are not on a diet, some pasta sprinkled with a litte parm. Hey, what would be a good side to go with this? Or is it a stand alone entree? im trying this tonight. it looks amazing!! !what makes it so healthy? 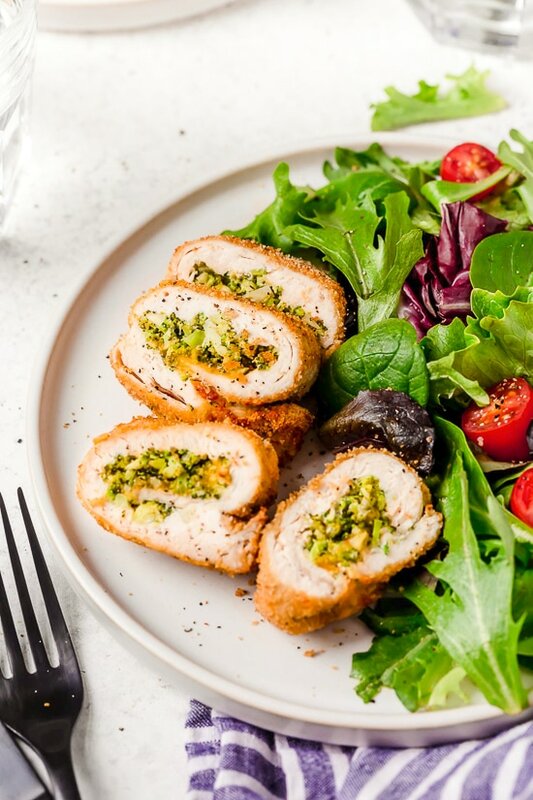 Hi Gina – what's the best way to slice the chicken breast? I can never seem to get it to come out right. Do you mean slicing it through the middle – as in, halving the chicken breast? Or cutting it up into three equal sections and then pounding them to make them flat? Thanks! Had this for dinner tonight! It was really good! There are only two of us, so I bought 1 pound of the thin chicken breasts and made 4 rolls. I used the Sargento thin sliced swiss cheese, except I used 2 slices per roll. And my breadcrumbs weren't whole wheat. With those differences, my points value was about double what yours is, but I'm ok with that. One thing I did was season both sides of chicken with salt and pepper. Next time I will do garlic powder on the inside as well. I also think they would do well baked at 375. Just wanted to make a suggestion for those who are struggling to slice the cutlets. 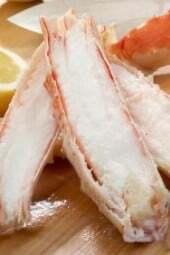 It easier to cut meat when it is partially frozen. Let the chicken thaw so that the inside is still pretty frozen but so that you can cut through it safely. Then it it thaw out the rest of the way and proceed with the recipe. Hi, Can i replace the breadcrumbs with oats? Made this for dinner tonight and it was AWESOME! Love that it is a healthy choice.